Oh live internet feed, I love you. I was able to ignore find ways to occupy my kids and glue myself to the computer for a couple of hours today, because I knew I wouldn't be able to avoid the news before prime time! I decided to take a few notes throughout the competition. Victoria Moors: Definitely one of the best floor workers in the world--a great example of beautiful choreography that flows well with the tumbling passes. 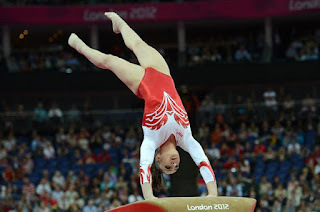 I so wish she had qualified to floor finals! And she would have, if she'd scored in prelims how she did here in team finals. Bummer. I love Russian bars. 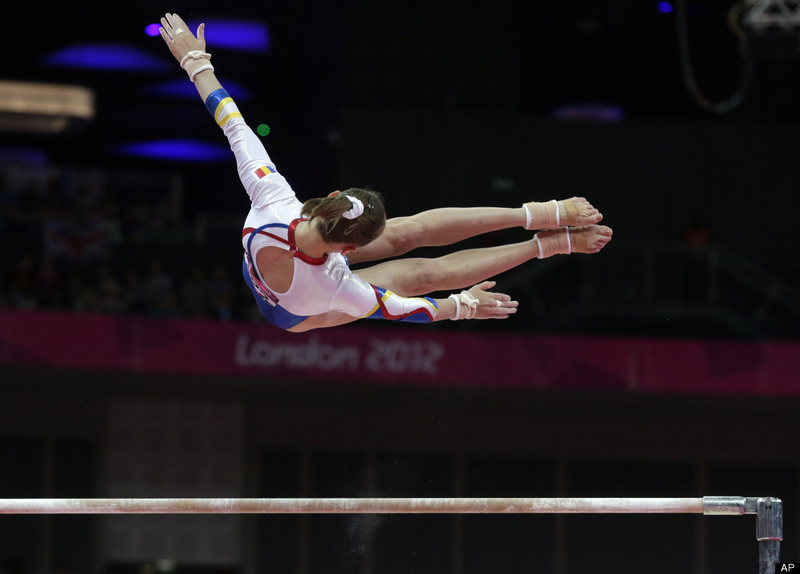 However, I still don't care for their giants: Nastia-style arch/knee bend over the low bar. I don't know why this isn't considered bad form. Catalina Ponor: I'm not a fan of the Romanians' manic, swingy-arm dance style, but wow, solid beam routine. 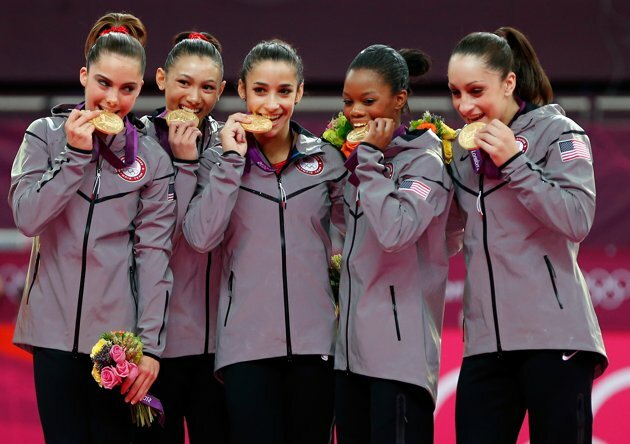 Beth Tweddle: Big moment at home, so why the silly choreography? It's sort of bad. Good thing she has bars to make us forget the cringe-worthy dance. It was at this point that somebody's big boy underpants got wet and that took a bit of time out from my notes. Then, my kids decided they actually needed lunch in the middle of gymnastics. Silly children. So my play-by-play didn't make it up to International Gymnast standards, but then they're not trying to view AND potty train. At any rate, I at least had to include a little fashion commentary. USA: More red. Again, not my favorite. I wish they'd come up with something a little more sleek and color-blocked and slightly less bedazzled. Russia: I still don't love red. But I do like the way their leo picks up the traditional style motif that we're seeing on their warmups and apparel, and applies it in a sweetheart design. Great Britain: I like the blue. The sparkly bits aren't too distracting. Not my favourite (see what I did there?) British leo ever, but it may be the best overall of this finals. Italy: I find the blue an odd choice. I know red/white/green can be a tricky combination to translate to apparel. But adding blue is not the answer. Japan: A little too busy for my taste. They love lots of graphics. The zebra stripes down the arm were a bit much. 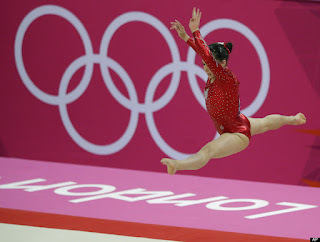 China: China rarely strays far from the red leotard with yellow stars or accents, a color combination that always reminds me of McDonald's. At least this time it looks like the material's a bit of an upgrade: they're frequently seen sporting cheap-looking crushed velvet. Romania: Two things are always certain about Romanian leotards: a) the sleeves will be pushed up, and b) I won't love it. Canada: Red. I like when the Canadians get a little crazy and go with different colors, but...it's just... red. And bedazzling. USA Team Warmups. I find these a little sad. But when you're biting a gold medal, who cares? !